March 20, 2011 I received an email from a lost cousin Linda Haynes Hardy who is decended from James Harrison Rogers she added details for more of her branch of the family and included a wonderful missing link in the family tree "By the way,family lore is that Mary Ann Allen was the daughter of Ethan Allen. David Rogers had a gun that belonged to Ethan and it was donated to the historical museum in Riverfalls, Wisconsin". Everything I could find on Mary Ann Allen pointed to Ethan, story of his gun originating from his grandson David Rogers convinces me. Anybody wanyt to debunk that can check the DNA. March 4, 2008: I have completed adding Nora Foley's list of Miller descendants and am now working on the book version of this web site. If you have photos of descendants or other historical family pictures that you would like included in the book please email them me at Rogers@LOOKinHERE.net be sure an include information on who is in the photo and and approximate place and date of the picture. It is also a last opportunity to add any corrections, descendants and family stories for the book. July 15, 2007 I have moved to Bonanza, Ourigan (as Robert Rogers spelled it) I am working on getting as many descendants as possible listed to include in a book version of this web site. The book will also contain family and tombstone photos, not on the web site. 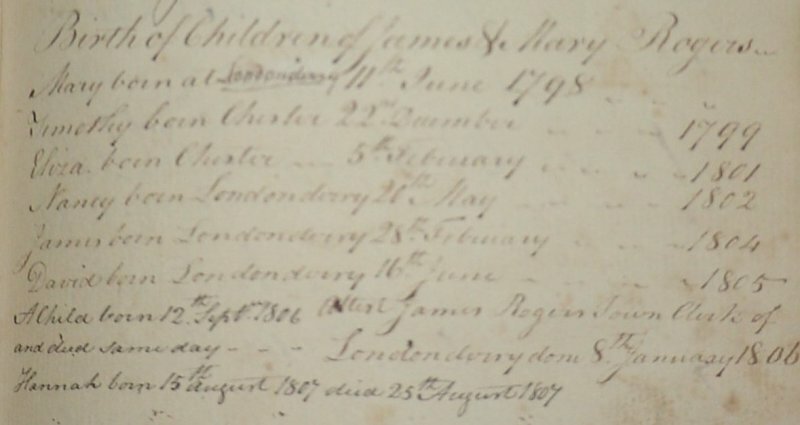 Birth records of the children of James Rogers and Mary Allen in James' handwriting recorded January 8th, 1806. Two children were added by James after that date, who died at birth and at 10 days old. Rest Haven Cemetery in Tompsonburg, Londonderry Township, Windham, Vermont. The tall monument above the gate is David F Faulkner and most of the Thompsons are just beyond it. The Tompsons and Faulkners are descendants of Martha Rogers. 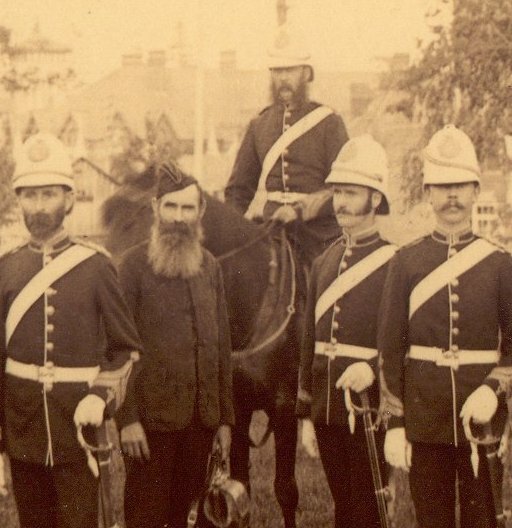 Col Robert Zacheus Rogers 1842-1911 on horseback he was also Warden of St. George's Church, Grafton Ontario, Canada. The family of Col James Rogers is buried at St George's. 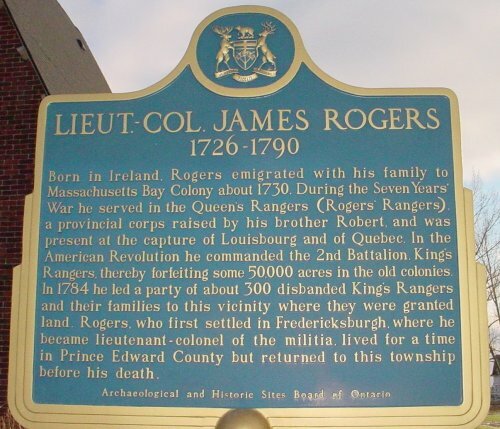 Historic Plaque on the loyalist parkway in Sanhurst, Ontario.